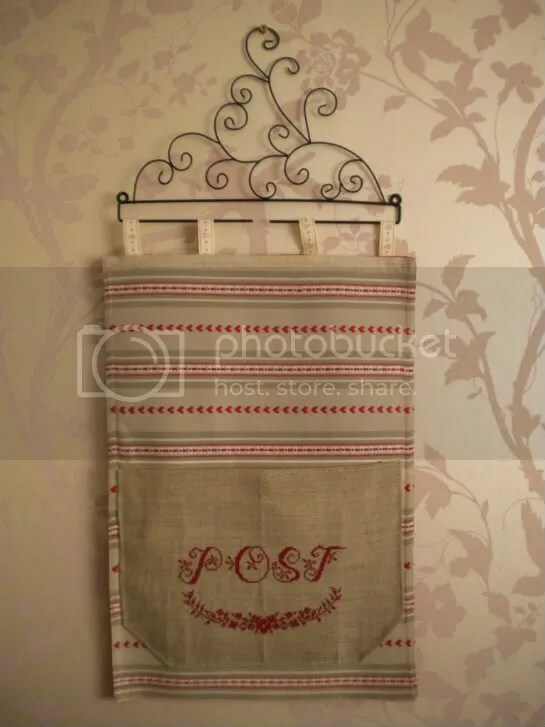 As you know I had promised my mum that I’d make her a wall hanging mail organizer (surely there must be an easier way of say that! 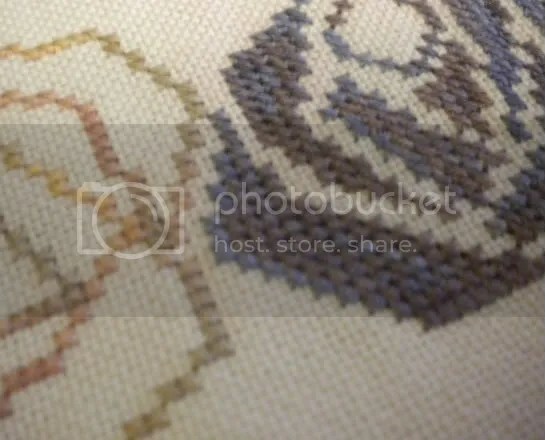 ), in any case I finished the stitching with only a few hiccups, but really struggled when it came to finishing it off. In the end I cheated, I found this beautiful place mat at John Lewis and since the dimensions were sort of what I had in mind I just attached the stitching as a pocket on the place mat. 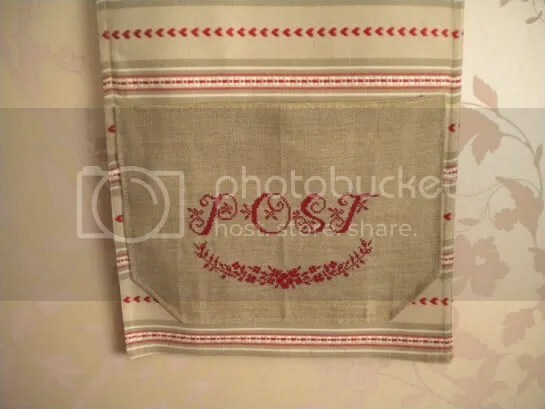 I had already bought a hanger from the RICO Collection and to attach the place mat to the hanger I made some loops at the top using some suitable ribbon. I’m really pleased with this one, probably one of my nicer finishes, in fact I might make one for myself. At the end of March I signed up for a bookmark exchange with one of my facebook groups. 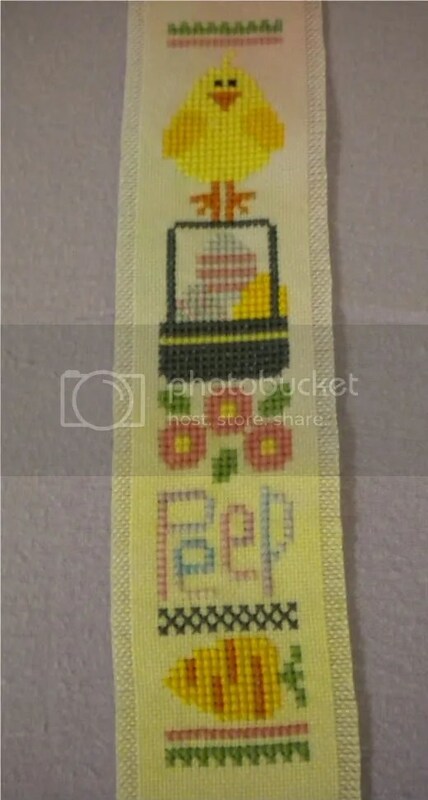 I decided to stitch a Lizzie*Kate pattern I received from a friend, it’s called Peep. I found some hand dyed evenweave (28 count I think) from Polstitches and matched the floss I had as closely as I could to the charted DMC colors (I was missing a couple). After I finished stitching I mounted it on some white self-adhesive felt, but I forgot to take a picture before sending it off. Here it is though before I mounted it on the felt. I also finished April’s Christmas ornament. 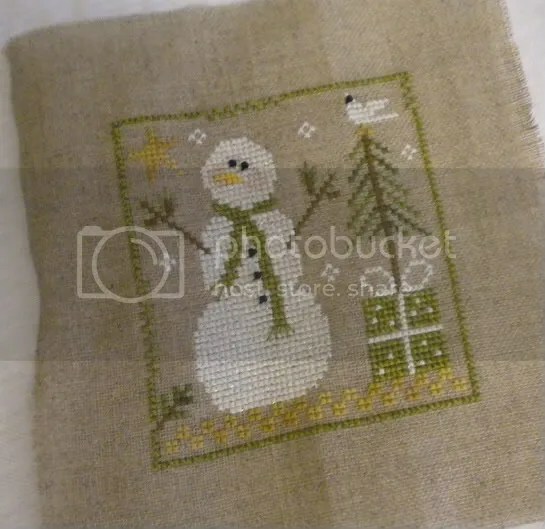 I stitched one of the Little House Needleworks (LHN) ornaments from 2010 – Frosty Flakes. I didn’t have the charted colors so I matched them up as closely as I could. For the scarf I had the suggested dmc floss, but I wanted it to look more like the hand dyed so I used two different colors together. I think it turned out rather well. The ornament was stitched on 32-count DMC raw linen, one of my favorite fabrics. Lastly I stitched up these Mackintosh Roses, the charts were out of one of my Zweigart booklets (the Rose one). 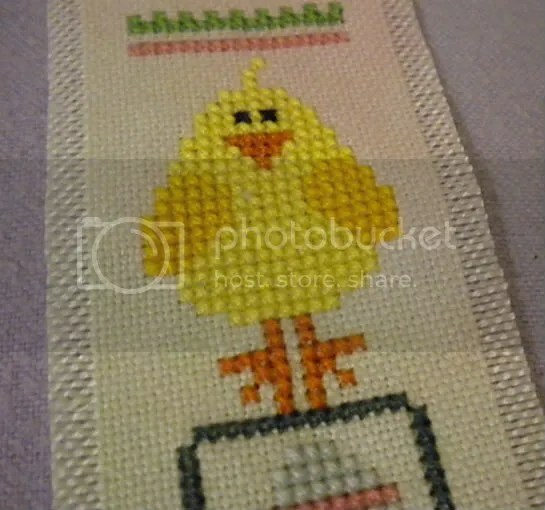 I used the same fabric as i did for the bookmark, but quite a subtle part of it color wise. And I stitched the roses in Victoria Clayton HDF silks Victorian Mauve and Tigerlily. I loved stitching with them, they didn’t tangle or any thing. I’ll make it up into a card, not sure who for yet though. While stitching I definitely thought the purple Victorian Mauve looked best, but looking at it now I love the different colors in Tigerlily. some really lovely finishes there Line. 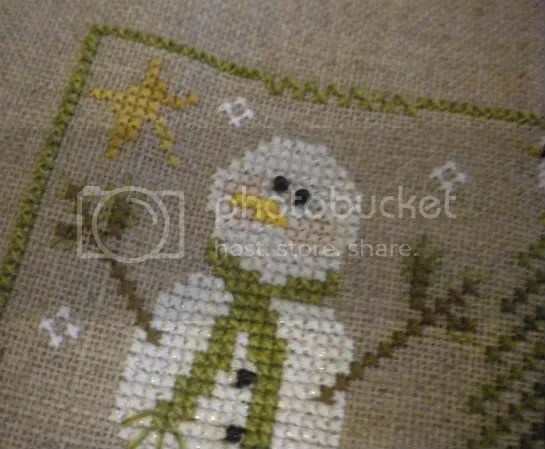 A great idea to use a place mat for the hanging mail pouch and your little chick and snowman are simply gorgeous. Those Mackintosh roses are also lovely in their simplicity.